Comments: Comments Off on Is Eagle HC Reid on the hot seat? Is Eagle HC Reid on the hot seat? Chiefs for a lateral move to the OC spot at Florida, I reported that there was a conflict between him and HC Haley. Vick and Kevin Kolb. Reid named Kolb the starter for the 2010 season. When he got hurt Vick became an exciting fan favorite. was named the starter for the rest of the season. As the 2011 season finally got underway, Kolb was traded to the Cards and the spitting contest between the owner and coach over this issue was settled. But there are other reasons that the relationship is cooling. While Reid has led his team to multiple NFC Championships, he has gotten to only 1 Super Bowl which he lost. While some blame the talent and tendency of long time QB McNabb to perform under pressure, others say that Reid was outcoached by the opponent. To try and get over Lurie has gone all in this season. As I was the first to report on my radio show before the lockout was over, he committed to spend the money on UFA QB Vick, all pro CB Nnamdi Asomugha, WRs Sinorice Moss and ex-Giant Steve Smith, RB Ronnie Brown, DL Jason Babin and Cullen Jenkins, TE Donald Lee and backup QB Vince Young. The feeling in Philly is that now Reid has all the toys he needs to win it all. issue with the Eagles. Now the team is 1-3 with a very tough game tomorrow at 3-1 Buffalo. But there is another reason that coaches’ lose their jobs after 10 years or so that is unique to pro football. for 8 or more years. Even the best coach can lose the ear and the heart of long term players after a while. Even Bill Parcells admitted that 10 years is about the limit of how long a coach in the NFL can be effective. Reid has been the Eagles HC for 13 seasons. 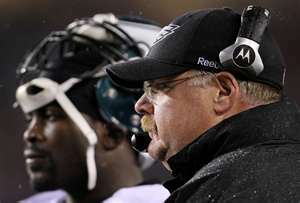 So unless the Birds turn things around and get to a Super Bowl don’t be surprised if Reid is not the HC in 2012.